What is Kaite Nelson holding? 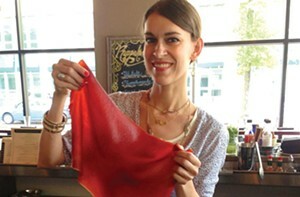 We asked Katie Nelson, head bartender at Rappahannock, what she's doing with that big red sheet: "I'm dehydrating sriracha to make a flavored salt. Once the sriracha is completely dry, you can pulse it in a food processor to pulverize it into a coarse powder, then add some of that powder to kosher salt, and voilà, sriracha salt! I'm using it as a garnish for a mango-cucumber caipirissima variation — I prepare the serving glass by moistening the outer rim of half of the glass with a piece of cucumber, and then I roll the glass in the sriracha salt before pouring the drink. The spicy flavor of the salt really accents the fruity mango notes of the drink. You should come try one."